HUNTINGTON, W.Va. - Marshall University fans can show their support and pride for the Thundering Herd in many different ways, one of which is by wearing their green Marshall gear every Friday throughout the football season. 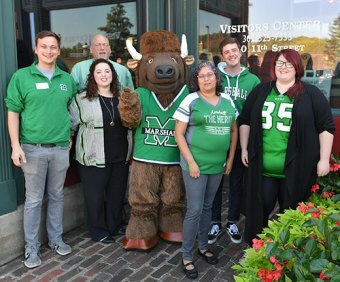 Marshall will kick off Green Fridays with College Colors Day Friday, Aug. 31– the day before the Thundering Herd’s season-opening game against Miami University in Oxford, Ohio. This year, Marshall fans have the opportunity to participate in a Green Friday contest to win prizes from the university. The contest is open to any group including businesses, schools, friends and family, or anyone who is part of the Marshall community. To enter, participants must post a photo on Facebook, Twitter or Instagram showing their Marshall spirit using #HerdGreenFriday. A winner will be chosen every Friday before a home football game. Participants have the chance to win Marshall football tickets and many other great prizes. For more information, contact Mallory Jarrell, coordinator of marketing and branding, by phone at 304-696-3490 or by e-mail at haye1@marshall.edu.